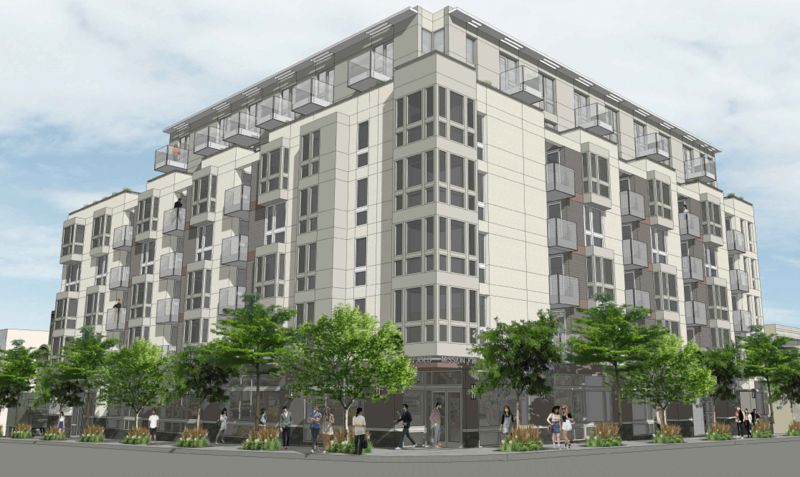 Planning Commissioners unanimously approved a proposal Thursday evening for 75 units of housing and a commercial ground floor to replace a long-abandoned gas station at 19th Street and South Van Ness Avenue. The proposal for 793 South Van Ness Avenue uses the state’s density bonus program to exceed the city’s height limits for that lot, meaning it will be 75 feet high with seven stories, compared to the base project’s five stories. Supporters of the project as well as commissioners emphasized that the proposal includes 11 below-market-rate units, which surpasses the number required by the state density bonus program. That program was recently used for a project at 2918 Mission Street, where commissioners expressed dismay with the state’s density bonus requiring a smaller percentage of affordability than local laws, since the density bonus is awarded without requiring additional below market rate units proportional to the building’s increase in size. The fact that Joe Toboni and his company the Toboni Group is a local family-owned business and the lot to be developed has been abandoned for years, also helped. “This is something a lot of us can’t really argue with,” said Commissioner Joel Koppel. But ultimately much of the discussion was about the character of the developer. Toboni and his son Joey said they’ll be putting the proceeds of the sales of the BMR units in their developments straight into a new nonprofit dedicated to building affordable housing. Not all critics of the project were convinced – several asked to delay a vote on the project so that activists and the developer could formalize a written agreement to hold the developer accountable. But those who had worked with Toboni in construction or at the various Mission nonprofits where he is a donor or a volunteer lauded his consistency and honesty. “Anything he says is pretty much the gospel. He’s a completely honest businessman,” said painter Kevin Sheppard. Critics hoped a delay would also make a clear plan for what should go into the ground floor to preserve blue-collar jobs rather than turning a former gas station into retail. Retail and market-rate housing in a blue-collar area, she suggested, would only accelerate gentrification and displacement of workers. “There’ll be nobody to clean the toilets of these luxury units,” she said. Commissioner Christine Johnson, too, said she had doubts about ground-floor retail, much of which in new buildings has struggled to find tenants. Zoning, however, already limits what can go into those spaces. In the end, the oft-reiterated need for housing in San Francisco and the praise of the developer’s attitude won the project unanimous support from the commission.